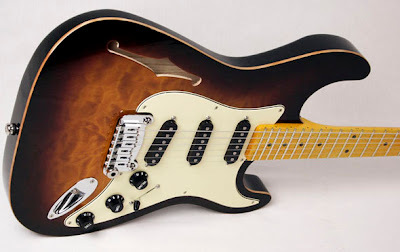 The folks at GUITAR ADOPTIONS have one sweet inventory of hi-end G&L product. You're looking at a Legacy Semi-hollow tobacco burst with quilt maple top, bound swamp-ash body and a maple neck with enough birds eye to give ya the big chill. Click the photo for several great photos from all angles. Hurry though, because when it's sold, that link goes away. I haven't been keeping up on G&L too well, but recently discovered they do semi-hollow "Thinline" types throughout their line. They are really promoting the semi's too! Besides one FCS John English Thinline Strat, I haven't seen Fender do a production Thinline Strat (please correct me if needed). G & L is doing very well these days-- still in Fullerton, CA. Besides the Legacy, their other S-types include the Commanche and S-500 series (all avail. in semi-hollow). Resonance rules!! Back when CBS was runnin' the Lazy F Ranch, breedin' mad cow instruments, Leo Fender felt obligated to get back on the horse and round up some heartier breedin' stock. He and George Fullerton founded G & L which today is going strong under Honorary Chairperson Phyllis Fender and a solid team. In a somewhat related parallel, Heritage Guitar, Inc. is still hangin' in there, in Kalamazoo-- stickin' it to the G-man down in Nashville. Atta boys!! !